The experience of moving through the geographically- and emotionally-familiar landscape of Dear Esther. I recently finished Dear Esther by thechineseroom after much deliberation and critical analysis (read: watching the first five minutes of a Youtube "Let's Play" and instantly signing on to Steam to buy it) and, over the course of about an hour and a half, finished it. And, since the narrator of the game saw fit to share his experience in a letter to his dear Esther, I thought it'd be good to share my own experience of this indie title. 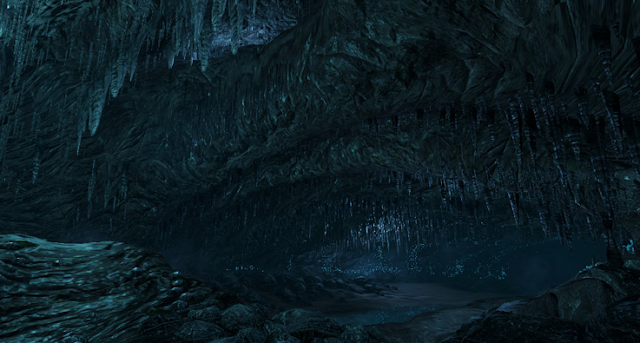 Dear Esther is hard to pin down. It's a game without many explicit mechanisms, without complex actions to take, without people to interrogate or puzzles to solve. The player takes on the role of an unseen protagonist as they explore a mysterious island, with one and only one option available to them: "keep going". 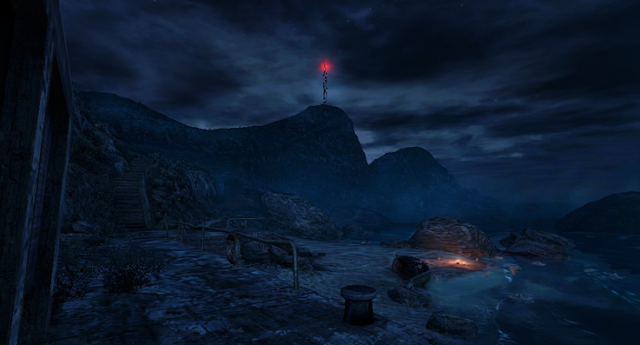 An unnamed narrator speaks aloud as you explore the island, prefacing many of his monologues with "Dear Esther", as though reading aloud a letter he had written to this unknown person. These monologues often make mention of something relevant to where you are in the game - when passing a cave, the narrator related a story of a hermit that was once said to live there, for example - but over time, certain key ideas, concepts and phrases are repeated throughout the game, often in different contexts, scenarios, metaphors and anecdotes. Eventually you're left wondering how much of what you're hearing is fact and how much is an analogue or allegory for some event in the narrator's past. The island itself - another unnamed character - lies in the Outer Hebrides off the coast of Scotland, and we start our journey as a nondescript, unseen - again, unnamed - individual, standing at the shore and looking out to sea as dusk begins to creep in. A lone radio aerial - a blinking, beckoning beacon - stands solemnly on the horizon, and, for lack of green pastures, presents itself as the best thing to aim for. So it was that I started my exploration of this odd little island. Having lived in Scotland all my life (though not in the Outer Hebrides), the landscape in Dear Esther felt homely. Not that I'm particularly eager to cuddle up to swaying bracken or lichen-marked boulders - its more that stark severity of Scotland's countryside as realised in Dear Esther felt recognisable, relatable and familiar. When I was a kid, I used to spend most of my time (when I wasn't on my SNES, obviously) playing at the burn where I lived: a long stream that ran from the hills at the back of town all the way to the firth, with bridges spanning across it as it wound through the town to allow trains, traffic and pedestrians to cross over it (and allowing me to pass under them). In my mind, each segment of the river bisected by these bridges was its own tiny country. On clear days, I'd make it my mission to travel to the river-countries further upstream, eventually making it to the vast wilderness where there were no more bridges to pass under — and just hills for miles around. Untamed and uncharted (at least, for me), escaping the town and getting into the hills felt like I was a lone adventurer, the last boy on earth exploring a lost, forgotten land, occasionally stumbling on signs of habitation - a winding trail of wooden posts with barbed-wire stretched between them; a dilapidated shed with no roof; a rusted hatchet ominously nestled in the undergrowth. So it is with Dear Esther - you're alone, wandering the hills of this unnamed and unknown Hebridean island, following the footpaths - or eschewing them altogether, to carve your own - and occasionally stumbling across signs of lives lived long ago, little murmurs of evidence that once-upon-a-time, this island was inhabited. But everyone's gone now. The island is dead, the magic is gone, and all that's left are the swaying sedges and whispering grass. Once I'd fallen into the cave systems underneath the island, though, that all changed. Colossal caverns, lit up by bioluminescent fungi and glowing lichen, were like nothing I'd seen before; underground streams trickling through the jaws of stalactite-studded grottoes, water spiralling down into yawning chasms and under crystalline bridges. The grounded realism of the bays and hills of the island gave way to a fantastic fairytale underworld where the world felt alive all around me. That's when the mythic side of Dear Esther began to creep in. I'd spotted odd symbols here and there on the island's beaches, heard stories about Esther, about Donnelly, about Damascus, car crashes and kidney stones — but as I made my way through the caves, the myths took on a living quality - circuit diagrams, cellular organisms and chemical bond illustrations dot the eerie environment like postmodern cave paintings, stories are told of the four characters in wildly different context, half-metaphor and half-allusion. In the underworld, all the questions bled into answers and nothing seemed certain anymore, except for a thought that kept recurring to me: with all this beauty and resonance, surely this, if nothing else, finally buried the discussion about whether videogames can also be capital-a Art? The artistic merit of the videogame medium has been argued time and time again, and it seems that as time marches on, more and more people are convinced that videogames can be works of art in their own right. But Dear Esther, a game that struggles to be labeled a game? Is it art? Is it even a good example of this interactive medium, considering there are no mechanisms to interact with, no ways to win or lose, no scores to keep track of and nothing to do other than to experience it? Most importantly - does it matter? I think that's a whole other discussion - but I definitely think it's a work of art, regardless of what medium you wanted to file it under. Emerging from the underworld and stepping onto the sand of the night-time shoreline, it was as though the island had become enchanted by that strange magic lingering inside the tunnels below. A perfectly round full moon, hanging low and shining brightly, cast a dim glow across the sea and illuminated the haunted, haunting hills around me - and right above was the still-beckoning radio antenna. The stories were still uncertain, and the symbols were growing more extravagant and unusual: quotations from scripture, a framed, smashed photograph in a cave, a paper armada bobbing in the waves. The last stretch, trekking up the hill to the aerial, felt uplifting, even though I was still so uncertain of what waited for me up there. In a way, I should have known, having studied Joseph Campbell's Hero's Journey my previous semester - after the initiation and descent into the underworld comes redemption and sacrifice. 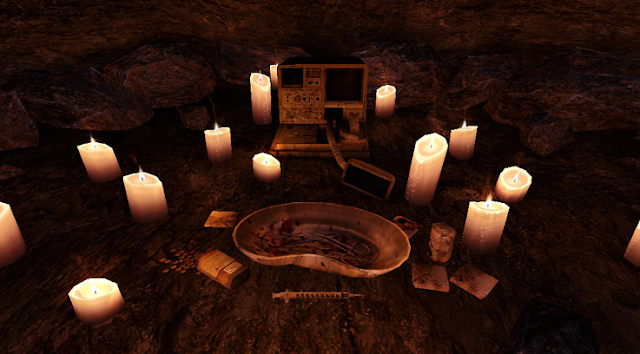 So, what is Dear Esther really "about"? 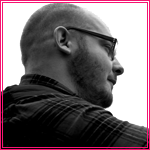 On one level, it's a game where you explore an island; on another, it's about an unseen narrator telling you his story; on yet another, it's you exploring that story through veiled metaphor, allusions and allegories. I realise now, though, that it wasn't so much that the narrator's story (and my journey, if they're not the same thing already) were allegories, it was more that they were overwhelmingly applicable to hundreds of scenarios. 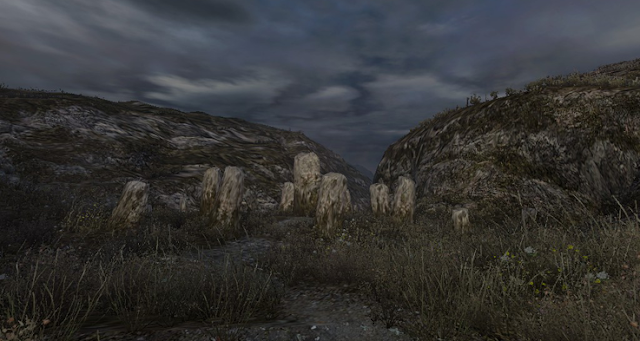 Like all good art, Dear Esther can be interpreted in multiple ways, skewed and distorted by every viewer's lens of personal, lived experience, disassembled and dissected for meaning and relevance then rebuilt in myriad philosophical frameworks.